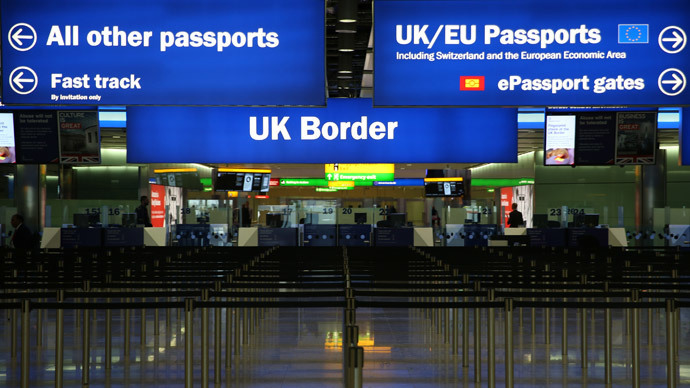 Three times as many immigrants entered the UK in 2013 as did in 1980, with the majority seeking employment, the government’s statistics agency says. In a report, the Office for National Statistics (ONS) highlighted the changes Britain’s population has seen over the past 30 years. This includes a threefold increase in the number of people entering the country each year, with 209,000 people having migrated to the UK in 2013, compared to 173,000 in 1980. Since the mid-1990s, most people have migrated to the UK in search of work, while the next most popular reason being to study. In addition to providing an insight into Britain’s changing demography, the figures also deal a blow to Prime Minister David Cameron’s credibility on immigration. Before the 2010 general election, Cameron pledged to cut net migration to 100,000 during his five years in office. However, net migration – the difference between those entering the UK and those leaving – stood at 209,000 in 2013. Critics will point to this as evidence of Cameron’s failure to meet a key campaign pledge. Overall, the report by ONS showed a country whose population has transformed significantly within a generation. The report’s historical perspective also charts the history of Europe, as the breakup of the Soviet Union in 1991 and the expansion of the European Union (EU) in 2004 led to freedom of movement on an unprecedented scale. More people have entered the UK than have left every year since 1994, with numbers increasing during the 2000s as a result of the EU’s enlargement to include 10 new countries. The origins of Britain’s immigrant population have changed even in the past 10 years. In 2004, the top two countries where people migrated from were India and the Republic of Ireland. While India retained its #1 spot in 2013, Poland had risen to # 2. The financial crisis and ensuing recession caused net migration figures to drop, as more British residents chose to leave the country and fewer immigrants chose to arrive. “More recently, as the UK economy recovers from the recent economic downturn, net migration has begun to increase once again – with work generally the most common reason for migrating here,” the ONS said. “The impact of migration can be felt across the UK economy and society in the composition of the population and labor force, and also through demand for public services and housing,” ONS added. According to ONS forecasts, Britain could overtake Germany as Europe’s most populated country by 2040. The UK population is projected to hit 74.2 million in that year, 10 million larger than today.